One of the challenges of online PhDs is how to keep a good dissertation advising process working, mediated by technology to bridge space and time. In an on-campus PhD, a student has the benefit of a community: fellow students hanging out in the library; walking into the office of dissertation committee members and advisers; graduate student lounge; graduate student association activities. However, the online PhD experience may be lonely and challenging. So, let’s look at some tips from the student and the faculty perspectives. Many of these tips come from my own experience with an adjunct methodologist. What would you add? Adapt to your adviser’s style. I had an amazing methodologist; but at first I was frustrated with how low-tech he was. I wanted to videoconference; he used the phone. I wanted to email my documents; he wanted a hard copy. I later learned what an expense it would be to an adjunct methodologist to print; so now I better appreciate his requirement of mailing. I adapted by buying the flat rate mailers; and soon found that this strategy contributed to a faster turn around time. Summarize notes. As soon as we got off the phone, usually about a 30 minute conversation, I would take my scribbles and write them up into official notes and email them back to him. I did this recap to help keep the information in my brain. I always felt like it was falling out of my head. But another huge benefit was a record of what we had discussed, a todo list of what I was supposed to do next. This made it easier for my adviser to keep track of my progress. Use a recording device. It’s a great idea to use some type of method to record the conversation with your dissertation chair or advisers. This allows you to go back and listen to it again. Often as students, the information overload causes us to miss something. Hearing it again and ensuring that we’ve responded to all feedback makes for a more efficient and pleasant process for everyone involved. Respond to feedback soon. Don’t procrastinate in working on the changes or next steps discussed in the meeting. The longer you wait, the fuzzier the concepts get in your brain. Do it soon! I usually talked to my methodologist on Fridays, and then Sundays I’d do the work that we discussed; trying to get another version in the mail by Monday. Plan for “waiting” jobs. Plan to have some things to work on while you’re waiting for feedback. One easy job is making sure your references are in your software tool (Endnote, Zotero, etc.) and are correct. Check the caps on all the titles. Check the page numbers. etc. This will help you stay in “dissertation mode” and will save you in the long run when you get to final editing stage. Schedule regular meetings. Your on campus students have easier access to you. They can pop by your office. But your online students only have phone and email. If you don’t respond to email quickly, they can feel neglected. An easy way to resolve this challenge is to schedule regular meetings. This provides deadlines for both you and the student. Schedule your reading time. Put an appointment on your calendar to schedule time to read and prepare feedback. What gets scheduled gets done! Use a videoconference tool. Our institution uses Zoom, which allows several features that can be helpful in discussing writing: screen sharing, annotation, and recording. Depending on the tool, have the student record so the recording is on their computer. Videoconferencing is as close to face to face as you can get at a distance; and the ability to get tone of voice and body language enhances the interaction significantly. Your academic technology office probably supports a similar tool and can provide access and training. Use TurnItIn. Use TurnItIn to check for proper citation early and often. Your academic technology office should be able to set you up with a space for dissertations. TurnItIn can even be set up for students to have access to see the results to help improve their citations. What would you add? What have you found as essential tips or tools for online PhD students – from the student or the faculty perspective? Please comment! One of the online collaborative tools I’ve been learning lately is project management software. We are playing with Zoho Project Management (selected due to it’s integration with GoogleDocs). I’d heard of project management software before but didn’t really have a need for it. We (Andrews University) inherited 120 courses through the merger with Griggs University. These courses are in need of upgrading. After spending several months getting a handle on the state of the courses, how they were used, and stats about them, I knew that we needed some method to manage the work of the upgrades. In addition, we have several staff working on the project. I wanted a way that everyone involved could see the work to be done and could even pick next projects on their own. Self management is possible if everyone is trained and can see the pile of work! All of these people have logins to the Zoho site except for the course authors. But we did make a dummy account called “AUTHOR” so we could mark and track various tasks that the course author is doing. Tasks. We have a Task List for each course. We may assign work to the students, or they can also assign themselves to a job. They know to pick a job that they are trained on. Within Tasks, each job has a completion graph. Everyone is putting the percent finished at the end of each day so we can monitor progress and who will need another job soon. Milestones. At the moment we have four milestones. We are using them as big categories for the sets of courses we are working on. We have a deadline for each milestone. Wiki. We have a couple pages with instructions, and have collected a few supporting links. Documents. We haven’t put up too many documents – a few syllabi in progress. Most of our documents are on our shared drive for courses instead. Dashboard. 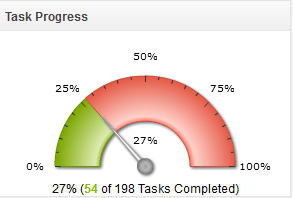 The dashboard is fun to see our progress. Now that we have a system going with Zoho Projects for our course development, I’m starting to think about other ways we could use this. Online Course Approvals. We have an Online Course Approval process that is required by our accrediting agency (NCA HLC). We have built a process that divides the work among the committee members. I’m thinking that Zoho Projects might be helpful for tracking the work. Dissertations. One of my assignments is to figure out a way to track dissertation progress and provide online tools that support it. We have a few doctoral level degrees in the School of Education that are online – and an online tool to support the dissertation/thesis process could be very helpful. I haven’t seen anything online designed specifically for this, so it seems maybe project management software would help. We could have document versions, task and calendar tracking, as well as discussion areas. I have questions around this still, but am thinking about it. We currently have one Zoho Projects site, which is free. If we expand, we’ll probably look into getting into some type of campus wide plan. But so far we’re not ready to think about that! What about you? Do you have any large scale projects that need managing? How do you track them? What tips do you have? In preparing to defend my dissertation in July, I collected several notes in case others asked me what went well, or what advice I might have for others. I thought I’d share them here in case they are useful to others. Read a dissertation in your intended field as soon as you can. A month before I started the Leadership PhD I found one of the key dissertations that I quoted throughout my study. It was very helpful to see how the dissertation was put together, to get a map for what was ahead. Create a research journal. My research journal at first contained my search methods for finding articles and dissertations on my topics. During my statistics classes I recorded questions and thoughts about my own research ideas. During the writing stage, I recorded notes, questions, learning from talking with my committee members, and lists of things to fix in my dissertation. It ended up about 30 pages long, full of notes & ideas. Email Summaries. Another useful practice was my email summaries. Soon after I talked to a committee member, usually within an hour, I wrote a list of things I learned and things to change. This helped me rephrase my learning, “catch it out of the air” and nail it down to words that I could re-read later. Some of the statistical procedures and knowledge I would have immediately forgotten if I hadn’t written it down. My committee members also found this habit very helpful as they also had a record of my understanding of what was said. They corrected me as needed. Adapt to your advisor. I thought at first that I wanted to work via email because I want to be able to read things over & over. Yet one committee member wanted to work via phone. I found that adapting to this method was wise because of the give & take that occurred in real time. Ask questions. If you don’t understand something, don’t just say “uh, huh.” Ask! Clarify. Check for understanding. It’s your own learning! Take control of it! Take the initiative. After getting feedback on one set of multiple regression analysis, I did all the rest of them. I didn’t wait to be told to do the next analysis. Playing with my data helped me know it better, even when I had to redo analyzes. Know your data well enough to find errors. Several times I found odd results that didn’t look right. Upon further examination they weren’t right! Understanding your data and the analysis makes it much easier to reflect on the results and implications. Psych yourself up to spend time on formatting. The formatting will take longer than you expect and can get annoying. Just psych yourself up to know it’s going to be a pain and slog through it! It’s part of the process and makes for a clean nice looking document when you’re done. 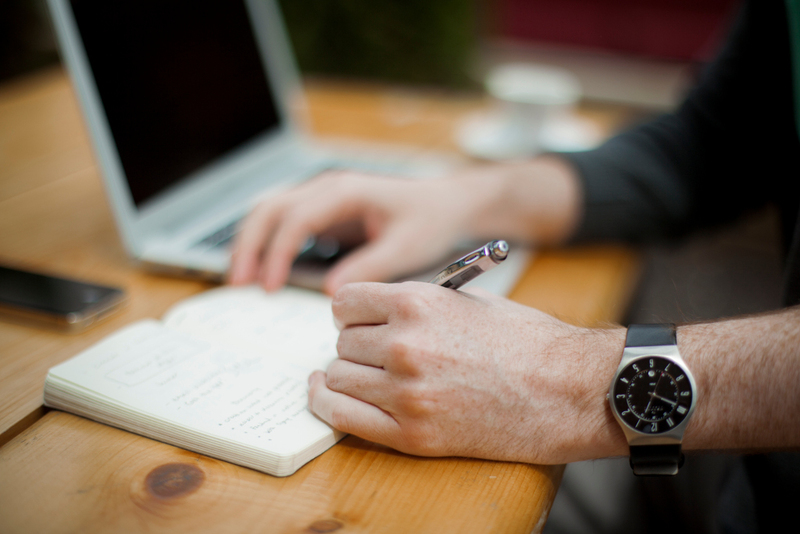 What tips do you have for doctoral students writing a dissertation? Feel free to comment and share!